The Truman student section was onto something before the game. They started jumping up and down in the stands and created a cloud of baby powder which was tossed in the air by several in the crowd. Their prophecy came true when the Patriot football team improved to 3-1 and 2-0 in the Suburban Middle Six Conference with a 35-12 win over Ruskin Friday at Independence All-School Stadium. 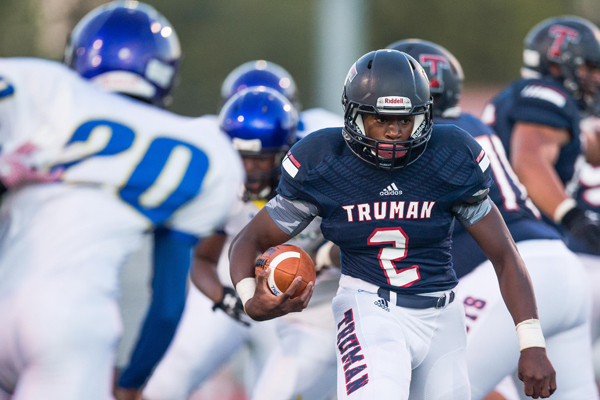 The win marked the best start for Truman since 1994 when the team began 4-0. The hot start – combined with a 2014 season which saw the Patriots have a winning season for the first time since 2004 (6-5) – has their fans excited and has the stands significantly more packed than two years ago. “They love, we love it, everybody loves it,” Patriots defensive end/tight end Phillip Woosley said of the team’s recent success. Truman coach Gregg Webb concurred. Running back Jordan Salima is a big reason for the excitement surrounding the program. He rushed for 203 yards on 20 carries against the Eagles. It wasn’t easy for the team on the first drive, though. The Patriots had a fourth-and-five on its own side of the field and Webb decided to roll the dice and go for it. Quarterback Dean Clemons moved the chains with a 7-yard run. On the same possession, the team was faced with a fourth-and-nine, Salima picked it up with a 30-yard scamper.